Well we all know Sonam Kapoor’s upcoming movie ‘Neerja’ based on real story is gonna release on Feb 19th(If not, nail the date) and Sonam has already started promoting her movie with all the grace and fashion for which she always is discussed about. Not to lie, more than her any movie we wait to watch what new fashion and style she is going to gear up with any movie promotion. I wonder from where the hell did she get this blessing of being queen of fashion and style, apparel and jewellery, glares and stilettos. Everything is just to die for and not everyone can go this bold and look fab as much Sonam Kapoor does. Sonam in DollyJ Outfit frilled dress with accessories from Suhani Pittie and stilettos from Louboutin. She was styled by Rhea Kapoor as always. 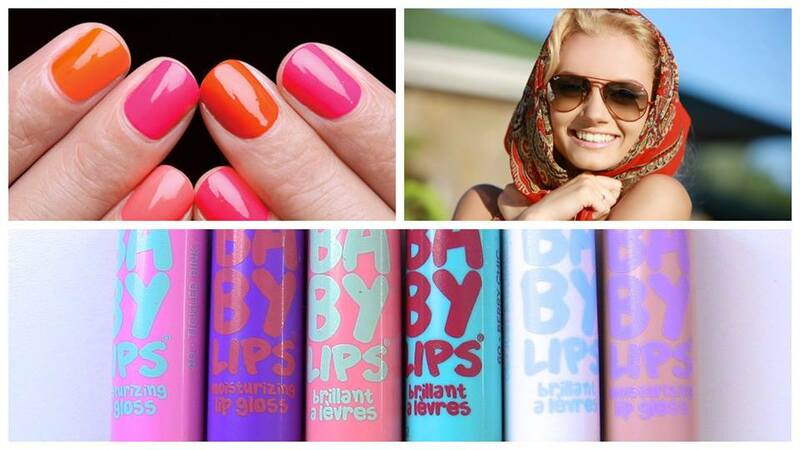 Simple chic look, isn’t it?! Sonam Kapoor’s Husband Changes His Name To Anand S Ahuja; S means Sonam? This one is latest during the trails promote at radios for amazing music of Neerja. Dress from Eliesaab, Handbag from Mrselfportrait and stilettos from Louboutin again. Lovely dress with the cut work and see through. Sonam Kapoor at Chandigarh to meet journalist in Rajesh Pratap Singh polka dot outfit which she paired with stilettos from House of CBshoes. She looked outstanding. Didn’t Sonam Kapoor make us envy in this Ethnic look at Comedy nights with Kapil show. Looked stunning in Silk tanchoi top and brocade silk skirt with tussar silk dupatta from Ekayabanaras. She picked earrings from Dhora. 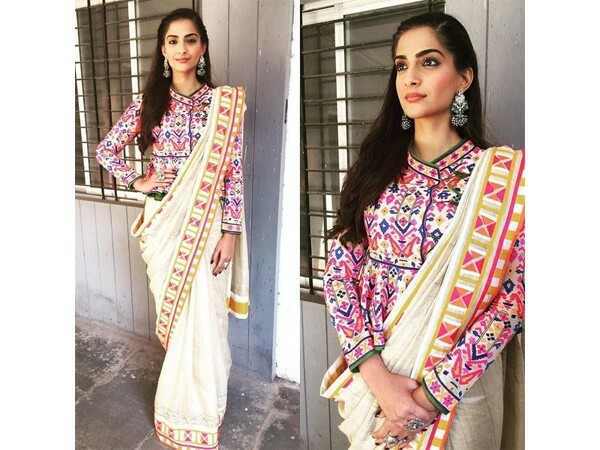 Sonam Kapoor is seen in ethnic look more during the promotion though not usual of its kind. Sonam Kapoor styled achkan with floor length skirt from Payal Khandwala with peacock chandelier earrings from Apala by Sumit. Sigh! Never get tired looking at her. Sonam Kapoor is good at bringing any fashion back. This retro style she picked from most adorable designer Anamika Khanna. Now this called classy edgy outfit. Again ethnic look with palazzo pant and lucknowi chikankari kurti along with polki dot dupatta was adorned from Sheela Khan’s wardrobe. Sonam kept it so simple with the look hair do and makeup. 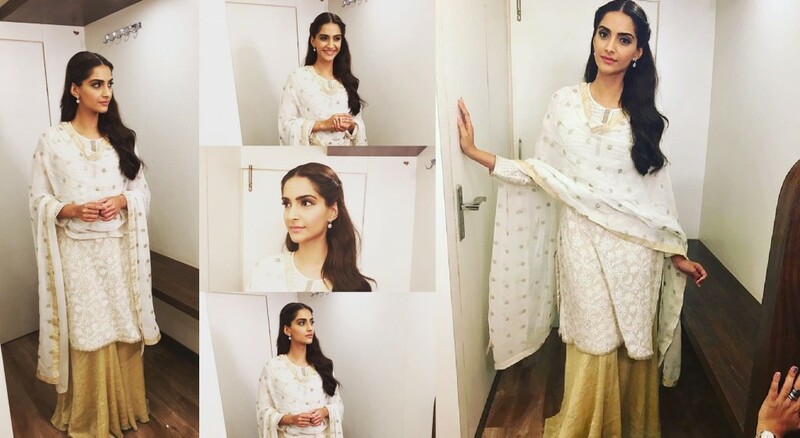 Sonam Kapoor in Indian tradioonal look with this off white khadi saree with embroidered border and colorful khathiyawadi high neck styled blouse from Abujani Sandip Khosla collection. 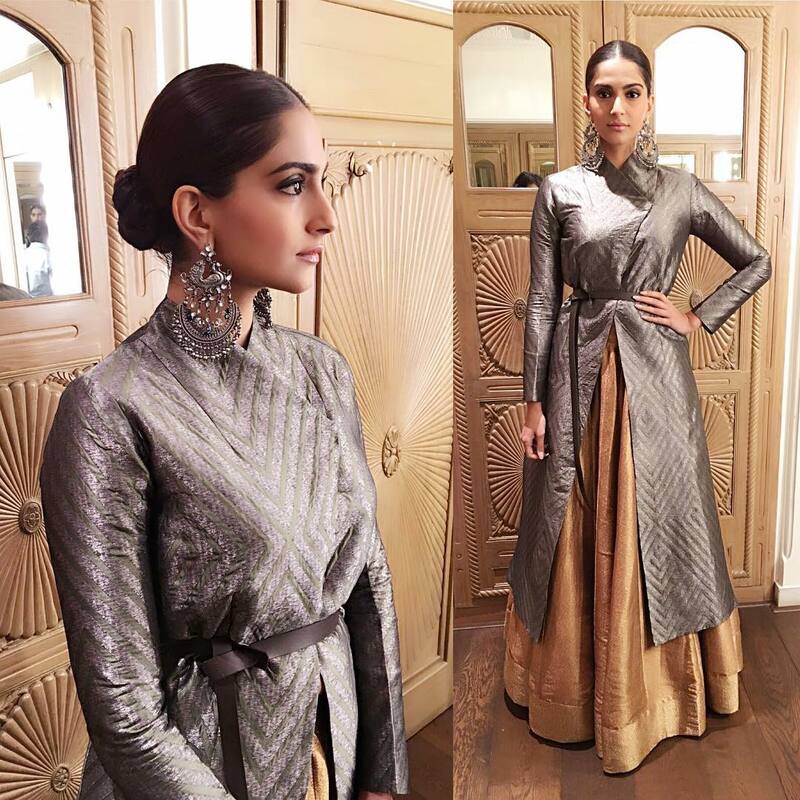 Sonam Kapoor flaunts confidently in Abu Jani & Sandeep Khosla with it comes to pick ethnic wear. She made it style statement by wearing dupatta with this organza print saree. To complete the look she wore gajra too. Which look of Sonam Kapoor you adorned ? Let us know in the comment box below! Pingback: Chikankari Kurti – An ode to Bliss – Chikan up your attire!